The Kamchatka krai is located in the extreme northeast of Russia. The territory area - 472,3 thousand км2; its big part - 301,5 thousand км2 - is necessary on Koryak autonomous region. Within edge are: peninsula Kamchatka with a part of continent adjoining to it, Karaginsky and Commander Islands. The Kamchatka krai surpasses each of such countries as the Great Britain, Italy, Norway, Finland, Sweden, and concerning territory of all Russian Federation the edge territory makes 2,8 % in territory. Northern point of edge is located almost at an Arctic circle. The greatest width of a peninsular part of 470 km, continental - 640 km. Prodeleting of territory of edge from the north on the south - throughout almost 1600 km. Distance from Petropavlovsk-Kamchatka to Moscow of 11 876 km (9 time zones). The edge territory is washed by Pacific ocean, Ohotsky and Bering sea. The overland border is available with Chukchi autonomous region and the Magadan area. In the south the narrow First Kuril passage separates peninsula Kamchatka from island Shumshu of the Sakhalin area. The western sea borders separate peninsula Kamchatka from Khabarovsk territory and the Magadan area. Within the sea Beringova and Pacific ocean there passes Frontier of the Russian Federation. Kamchatka and Kuriles are unique areas in Russia young volcanoes enter into a Pacific fiery ring, forming the Kurilo-Kamchatka arch. On Kamchatka is available 28 operating and about 160 extinct volcanoes. Natural companions of volcanic activity are mud volcanoes and hot sources, including. Geysers. On Kamchatka about 200 mineral sources, 150 from which - operating. The majority is in East volcanic belt, it is much less - in Central range. At the western coast and in their northern areas it is few. The part of sources and hot keys is in craters of volcanoes or at the bottom of calderas, others are located in valleys of the rivers and on coastal terraces. Kamchatka Krai, supersaturated with moisture. There are more than one hundred and five large rivers with a length of more than 100 km of The largest river of Kamchatka, its length 758 km, and the river Penzhina (713 km Besides on a Peninsula more than 14 thousand small rivers and Brooks. And large and small rivers are very affluent. Their power is largely due to groundwater (55-56%), due to the melt water (35-40%). Well, the remaining interest, as you can see small, are to share rains. Even more striking, the number of lakes: their number exceeds one hundred thousand big and small. The largest lakes - Kronockoe and Kuril - are in volcanic regions of Eastern Kamchatka. Opening lakes occurs at the end of may - beginning of June, and full exemption from ice, have delayed some of them till the middle of July. Kurilskoye freezes only rarely. The climate of Kamchatka is notable for the diversity and change of the weather. On the coasts - marine climate in the Central and Northern areas the climate is closer to continental. In the Eastern areas the climate is very unstable: during one summer day you can of heat plunge into the cold autumn and after a few hours again rejoice in the summer heat. While in the twentieth of June on an isthmus, the Parapolish dale snow everywhere lays, the Karaginsky gulf is hammered by ice splinters, and on the rivers there is a high water, in the Central Kamchatka lowland the bird cherry and meadow grasses blossom, and around Petropavlovsk-Kamchatka many plants already fade, and the beach of the Avachinsky bay is visited by bathers though half of Avachinsky hill is still covered by a white snow cap. The coldest part of peninsula is the Central Kamchatka lowland, where average temperature of January-22 °С in the winter. The lowest temperature was observed around an island of Milkovo:-57 °С. But "cold pole" is in settlement Verhne-Penzhino where the temperature-64 °С is registered. In all territory of area within winter thaw is observed, cases of rise in temperature to +5 °С in January and February are frequent. Most heats at coast and islands are observed in August, in the central part of peninsula are registered in July. The greatest value, - in area with. Dolinovka (+37 °С.). The number of warm days with temperature above 20 °С on Kamchatka is insignificant. At coast for their all summer it is observed from 1 to 6, in a continental part - till 20-30, and in a valley of the river of Kamchatka - from 35 to 55. On formation of a climate of Kamchatka the big influence is rendered by cyclonic activity. Cyclones approach through southeast coast where they take out warm and damp air of the Japanese and Yellow seas, call long snowfalls, blizzards and gales. The temperature °С simultaneously raises on 6-10. In the Central Kamchatka lowland protected from influence of cyclones by powerful ridges, frosty, rather silent, slightly overcast weather of continental type prevails. Within the Kamchatka region, the rainfall is more than in any other region of the country and the seasonal unevenly. The highest rainfall of up to 2500 mm in a year - falls on the Eastern slopes of the mountains South of the Peninsula. The Central Kamchatka lowland, protected from the influence of cyclones, the ridges of Middle and East, it is an average of 400 mm in the North-East coast of rainfall increases again to between 500 and 600 mm per year. The lowest precipitation occurs in the extreme North-West of the region, up to 300 mm per year. 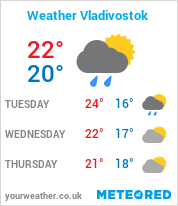 Summer in Kamchatka and rainy. In winter weather conditions are highly variable, that is expressed, for example, sudden snowfalls often accompanied by strong winds. Sometimes one day can fall 100% and more of the monthly norm of snow. In General, the amount of precipitation in the cold period of almost the entire territory of the region more than warm. And only on the West coast of the warm period of rainfall more than in the cold. Temperature, precipitation and other climatic factors, as well as geological structure, relief caused the contemporary glaciation. All in all there are 414 glaciers with a total area of 871,1 km2. They are mainly located in the highest mountain ranges and volcanoes. The longest glacier of Kamchatka - Bilchonok, located on the VLK. Flat far (the Klyuchevskaya group), has a length of 17,7km and occupies an area of B21,8 km2. Interesting ice array, Separate the p-e Kronotsky, where glaciers are located at an altitude of 600 M. The largest of them - Tusovski, length 5 km. Impact of glaciers on the climate of Kamchatka and nature in General insignificant.